Printed electronics does not involve printing electrons, but you get the idea. Every start up and corporate research group have their own version of printed electronics using different semiconductors, dielectrics or metallization strategy. As usual, I like to focus on patterning. There are 4 patterning strategies, conventional resists and imaging, imprint, flexographic and ink jet printing, and only two involve classic printing. The thing that they all have in common is patterning on thin, low cost, flexible substrates, and I cannot see any advantage to printing large patterns on silicon wafers. So the alternative to advanced silicon technology to make low cost electronics is really “flexible electronics”, and I know you cannot flex an electron! So how will FLEXIBLE ELETRONICS be fabricated? The least adventurous solution is to use photoresist and optical imaging. Given that the critical dimensions are around 10 um, this is a relatively easy solution, and simple distortion of the film can be corrected by standard magnification adjustments. Laser scanners allow correction of non-linear distortions. The earliest implementations attached the flexible film to a solid wafer to avoid distortions. 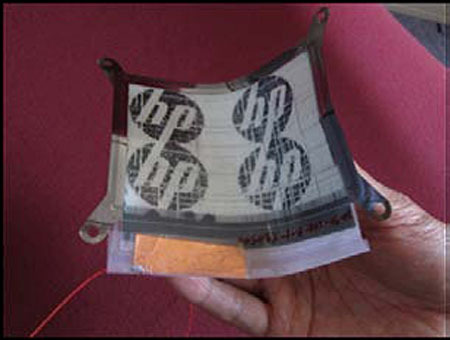 The most creative imprint solution is being developed at HP (www.hp.com) in their Self Aligned Imprint Lithography (SAIL). Their idea is to deposit 5 layers of different materials, then pattern all the layers using a single 5 layer mold to pattern a resist. Finally the 5 layers in resist are used to pattern different shapes into the underlying layers by etching. By patterning all 5 layers simultaneously, all concerns about overlay on a flexible substrate are eliminated. HP has fabricated a 160×120 transistor flat panel display backplane and are focusing on defect reduction. The SAIL approach radically reduces the lithography cost by 4x, and so represents a game changing solution for both fabricators and lithography suppliers! – wait till the Union of Concerned Lithographers get involved. Of the real “printing” solutions, ink jet appears the most attractive. The idea is to print functional inks to directly pattern semiconductor, dielectric and metal. There is no resist involved , please note the concerns of the Union of Concerned Resist Scientists . The latest ink jet printers have a 1 pico-liter drop size, representing a 10 um cube that can be placed accurately on flexible substrates because the drop position can be adjusted in real time. The challenge is all in developing the functional inks. Kovio (www.kovio.com), is one of the leaders in printed electronics, and has focused on silicon inks and has made high performance transistors. Other companies have focused on printing organic semiconductors which would seem to be a more natural candidate. The ink jet print solutions leverage the spectacular improvements in photo printers, and eliminate both resists and pattern transfer processes. 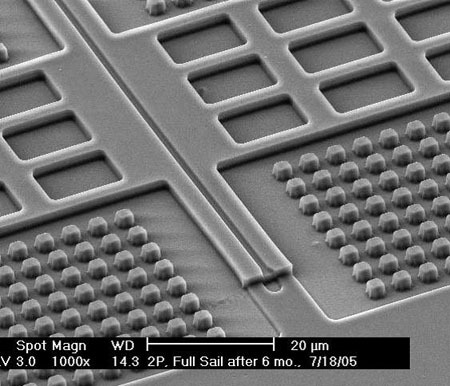 Taking a really simple view of costs, in conventional fabrication, there are 5 layers and 3 steps per layer (deposition, lithography, etch) so 15 operations in all. SAIL reduces this to 11 operations, and ink jet to 5 operations, suggesting that ink jet has the potential to be half the cost of SAIL, and one third the cost of a conventional lithography solution. SAIL does have the potential to fabricate smaller features, but as I noted above feature size is not a driving issue. SAIL does have the potential for higher throughputs and this may be an important issue in the long haul. Gravure or flexographic printing has the potential for higher throughput than ink jet, but overlay is a challenge. My take is that it is not clear which flexible patterning strategies will win , but that the potential for cost advantage in flexible electronics is very significant. It is clear that there is a real chance that flexible – printed – electronics will dominate in the sweet spot of devices with <100,000 transistors, or large area devices. Ink jettable functional materials would appear to be the highest leverage development opportunity.